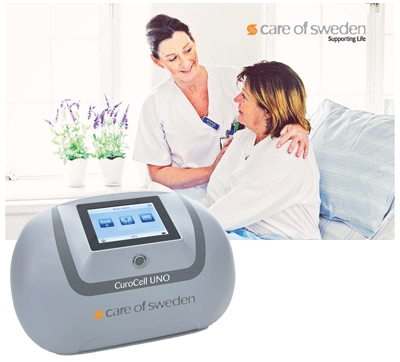 Dedicated to preventing and treating pressure ulcers, Care of Sweden introduced the CuroCell UNO® to the healthcare marketplace a few weeks ago. 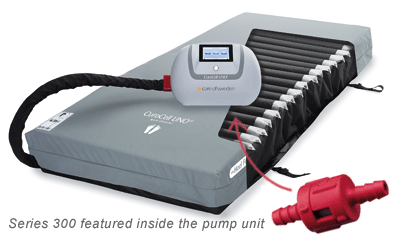 The CuroCell UNO® is a fully automated alternating pressure mattress replacement system. For people at-risk or suffering from pressure ulcers, the CuroCell UNO® is easy to use while providing optimal pressure relief and comfort for each individual user. The system's innovative technology is designed to minimize shear forces while optimizing micro climate. This device comes equipped with a touch screen panel featuring a user-friendly interface, and it incorporates a pump for automatic adjustments. People are often at-risk or develop pressure ulcers due to long periods of lying or sitting in the same position. The CuroCell UNO® provides much needed redistribution of pressure to these users. To ensure the highest quality of product, Care of Sweden goes the extra mile by using our own 300 Series Modular Valves within the pump unit. This valve is used as a precautionary measure in case the pressure in the pump gets too high too fast. If this occurrence happens, then the valve will activate and provide control. To learn more about this product, click here or watch their video on You Tube here. Smart Products offers over three million flexible design solutions for the medical industry and beyond. Our flagship Series 300 Modular Check/Pressure Relief Valves are an ideal solution for a wide variety of low pressure, low flow applications.